As people age, they often need help with their daily tasks. Many are more than willing to pay someone else to do the things they can no longer easily do. As a personal grocery shopper, you can turn your caring for seniors into a profitable new career. Personal grocery shoppers simply buy and deliver groceries for other people, such as busy working professionals, seniors and others who are unable to shop for themselves. Your main customers will be senior citizens. Whether it’s grocery shopping, running to the hardware store or picking up a prescription, you can help stay-at-home seniors get their to-do list completed without them having to leave the house. Your start-up costs are very low. First of all, it’s important to have a reliable vehicle to get you to and from customers and your shopping stops. You’ll also need a cell phone and computer to stay in contact with your customers. You’ll need a a great website and thats easy. To learn more about this little-known, but profitable service business, go to www.getgogrocer.com and http://www.getgogrocer.com/start.php to learn how to start fast and inexpensive. So the start-up expenses are small and the profits are big. How big? Grocery shopping services typically charge a $25 fee for a medium grocery order. That works out to a national average of $27 an hour. If you work a 40-hour week, that could mean over $50,000 a year! Plus, most grocery shopping businesses charge additional fees if they are being asked to shop outside their normal business hours or on holidays. As the owner of your own grocery shopping business, you decide what you want to charge. You decide when you want to work, and what jobs to take. You’re the boss. It’s the perfect career for those wishing to work on their own terms, and it’s a great way to help seniors in your community. There are over 40 million seniors in the United States today, and 80 million by 2030, as the baby boomers move into their “golden years.” More and more seniors will need help with their grocery shopping and delivery, as well as related errands, and you could be the one to provide that service in your area. 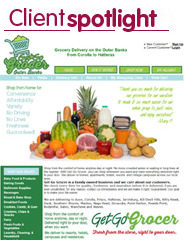 To learn more about this little-known, but profitable service business, go to www.getgogrocer.com and http://www.getgogrocer.com/start.php to learn how to start fast and inexpensive.